The musical was last Sunday; the cast party, last night; Stations of the Cross and the Lock-In are tonight; and Easter is this Sunday; man, this week has been crazy! All of what we’ve been up to has been wonderful to be a part of and experience and yet, calls to mind our delicate balance between busy-ness and worship. We’ve all been called to “to do good works, which God prepared in advance for us to do.” (Ephesians 2:10 NIV), and yet Jesus called out the Pharisees for being too caught up in their “good works”. Where is the barrier between work and worship? Jesus answers this question with his typical type of challenge: “’Love the Lord your God with all your heart and with all your soul and with all your mind.’ This is the first and greatest commandment. And the second is like it: ‘Love your neighbor as yourself.’ All the Law and the Prophets hang on these two commandments.” (Matthew 22:36-40 NIV). This is one of the many moments where I interpret as Jesus telling us “I gave you a brain for a reason, use it!” There is no specific line to be crossed, no do-this-don’t-do-that kind of rule that we can mindlessly follow, or mindfully tempt. We are called to judge each action independently against the rubric of the greatest commandments. We are not robots coded to have rules for every eventuality, but organic creations with the capacity to make our own decisions. Our “makers-mark” is our common desire to love and be loved. Our calling is to be mindful of the way we spend our days and measure our actions against these commandments. The barrier between work and worship is clear and undefined, simple and complex, challenging and humbling, what a wonderful thing to be trusted by the Creator to seek ever greater forms of worship! 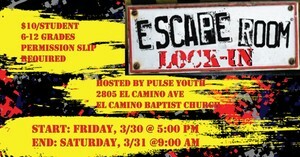 The Lock-In! : Good kids, good leaders, good times, good worship, good fellowship… Please pray for a wonderful time for all involved! The Lock-In! : Being locked in a room with 30+ teenagers for 16 hours. If that doesn’t inspire you to pray (or cower in fear or weep with pity), then I’d love to have you help at the next one! Experience Good Friday like never before. Stations of the Cross is a powerful way to contemplate, and enter into, the mystery of Jesus' gift of himself to us. It takes the reflection out of your head, and makes it an imaginative exercise through prayer, senses and emotions. Plan To Come & Expect A Blessing! Come and fellowship, pray, sing and learn from God’s word. Ministry Pacific is reaching out to formally request your attendance to our “Active Shooter Webinar”, hosted by Sergeant Ryan Sanchez on April 10th, 2018. This event is completely FREE, hosted online, and easy to sign up for. All you have to do is reply to this email with your name, your church / location, and number of attendees who will be watching with you. We’ll reply with your webinar login information!